Protank offers a complete line of plastic double wall tanks ranging from 15 to 13,700 gallons. We offer our double wall tanks in either HDPE or XLPE. Plastic double wall tanks are ideal for when complete enclosed containment is necessary. All of our double wall tanks will provide at least 110% containment of the primary storage tank. Most of the tanks have top flats for ease of installation of nozzles. They are completely enclosed to prevent debris and rain from entering the containment. Most of our double wall tanks meet ASTM D1998-06 standards. We can customize our double wall tanks with drains, external or internal fill lines, ladders, tie-down systems, level indicators, manways, and leak detectors. Our double wall tanks can handle some of the harshest chemicals such as Sodium Hypochlorite, Sulfuric Acid, Ferric Chloride, Hydrochloric Acid, Sodium Hydroxide, etc. 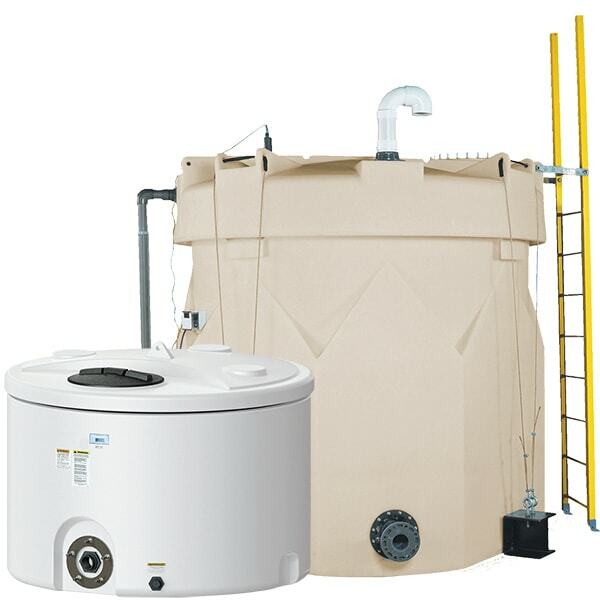 We offer double wall tanks in several different specific gravities including 1.5 and 1.9. If you don’t see an exact size double wall tank you are looking for below, contact us. Protank has the ability to custom make double wall tanks to meet a certain dimension or gallon.